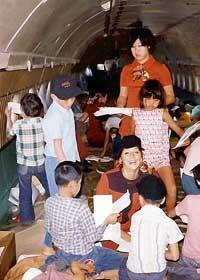 Babylift orphans carry their curiosity aboard Oakland-Vietnam flight. They called it a "second journey of a lifetime." Twenty-one Vietnamese men and women  originally airlifted out of war-torn Vietnam as babies and children in April 1975  on Monday boarded a plane bound for Ho Chi Minh City. But the symbolic retracing of Operation Babylift was much different than their dark-of night, covert journey to America on a World Airways plane 30 years ago. This time the plane wasn't loaded with milk and cookies or crying babies in diapers. This time, the sun shone, news cameras captured pictures, and friends and family members waved goodbye as the group boarded the plane  loaded with filet mignon and champagne  to a place the travelers once called home. "I'm very curious about how the homeland looks," said Thao Chao Le-Tran, a Vietnamese adoptee who is now 34 and living in Orlando. "I've seen a lot of pictures of Vietnam, but I'm anxious to see firsthand where I'm from. I'm curious about that part of my ethnicity." To mark the 30 years since Operation Babylift, World Airways spent $1 million to fly 21 adults from the 1975 flight back to Vietnam. There, they will spend two days at gala dinners, touring the city and meeting with dignitaries. "This is their second journey of a lifetime," said Randy Martinez, the chief executive officer of World Holdings Inc., the parent company of World Airways. the war-torn city of Saigon and knew he could do something about it ... he refused to just stand by." Most of the men and women who were on Monday's flight were just babies when they flew to the United States for adoption by American families. But Thanh Jeff Gahr was 12 when he took just the clothes on his back and headed for a new life in America. "World Airways is once again showing that its a leader in the humanitarian effort," said the 42-year-old Gahr, who lives outside Seattle and works as an electrical engineer for Boeing. "Even though Operation Babylift happened 30 years ago, its impact is still being felt today. My children and my children's children will always remember it for years to come." For men and women who started their lives in the worst of possible circumstances  orphaned or abandoned, often separated from siblings, and living in the rubble of the Vietnam War  this week will be a chance to see what they left behind. "This visit will revive some forgotten memories," Gahr said. "For some, it will be a chance to establish some emotional bridges (to their past)." Vietnamese Adoptee Wendy Greene (right) hugs Thanh Jeff Gahr before boarding a flight to Vietnam on Monday. The anniversary flight has been in the planning stages for two years so that every detail was covered, company officials said. On the 15-hour flight to Taipei, the travelers dined on crab and shitaki mushroom salad, filet mignon with Japanese leek sauce, beef Szechuan and celebratory champagne. In Ho Chi Minh City, they will bunk down at the Sheraton Saigon Hotel on World Airways' dime and eat at fancy receptions and buffets. A boat tour of the Saigon River, meetings with Vietnamese government officials, a tour of the Phu My Orphanage and a banquet at the Unification Palace are on the itinerary. They will be joined on the trip by family members, World Airways pilots Ken Healy and Bill Keating, who flew the original flight out of Saigon under dangerous conditions, and former World Airways flight attendants. World Airways chose to fly the historic Babylift flight to Oakland on April 2, 1975, because the airline had its headquarters there from 1956 to 1987. "Oakland was the first taste of America they experienced when they landed 30 years ago, and it's an honor to return to this city to serve as the departure point for our commemorative flight to Ho Chi Minh City," Martinez said before he boarded the wide-body passenger aircraft that was repainted with the company's red-and-white logo from 1975. Although the World Airways flight that was marked Monday was not under President Ford's official Operation Babylift initiative, it was the first to fly Vietnamese orphans out of the war-torn country. 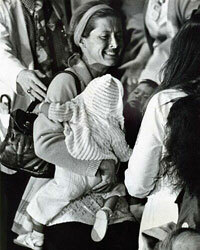 Many others followed, carrying more than 3,300 Vietnamese babies and children to the United States. This article is reprinted from the Inside Bay Area 06/14/2005 , with permission of author, Kristin Bender.